So, by now I am sure you know that Kevin Durant, former Oklahoma City Thunder superstar, will be joining the Golden State Warriors. Personally I am frozen in a state of shock, as I try to imagine a Warriors starting five with Curry, Durant, Thompson, and Green all on it. Durant’s decision to join the Warriors is as shocking and monumental as when LeBron decided to “take his talents to South Beach.” There are so many story lines to address in the wake of Durant’s decision, and my mind is swimming with everything this means for the NBA. So let us just start with what we know for sure. Kevin Durant has verbally agreed to sign a 2-year/54.3 million dollar deal, with a 2nd year player option; meaning he is really only guaranteed to be in a Warriors uniform for the 2016-2017 season. Also, this is the first time the two most recent NBA MVPs will be on the same roster (with Curry winning the last two years and Durant in 2014). Durant will also become the highest paid player on Golden State’s roster and has made them the overwhelming favorites to take home the Larry O’Brien Trophy for next year. When I saw “Durant to the Warriors” run across my timeline, the first thoughts I had were, what does this decision mean for Kevin Durant’s legacy? How will the history books view him? What does this mean for the league as a whole? So, after some thought, I have concluded that Durant can no longer be viewed as a potential “All-Time Great.” He will still, one day, be inducted into the Hall of Fame, it just won’t be in the same category as players such as Michael Jordan, LeBron James, Larry Bird, Bill Russell, Wilt Chamberlin, Kobe Bryant, etc. Don’t get me wrong, I completely support his decision and understand that he has every right to play for whoever he wants. I am just saying that even if he goes on to win multiple titles, I can no longer view Durant as “The Guy.” The only way I see Durant rejoining the class of players I just mentioned is if, somehow, he completely takes over the Warriors. That would require their current stars Curry, Thompson, and Green to take major steps back in their careers and I don’t see that happening. Even then, LeBron wasn’t validated in the eyes of many NBA fans until he won in Cleveland, so how can it be different for Durant. Kevin Durant made the best personal basketball decision by joining the Warriors. By moving to the Bay Area he has potentially created one of the greatest starting lineups in NBA history. My point is simple: he did it at the cost of his individual legacy. I believe in fairness and value unbiased opinions. So as an assumed fan of the NBA, I want you to be completely honest with yourself. If you said back in 2010 that LeBron James “sold out” when he moved to Miami then you have to hold Durant to the same standard because at least when LeBron joined the Heat he was instantly the best player on that roster. Durant has joined a team with the first ever-unanimous league MVP, a team that just won a record 73 regular season games, and a team that has already won a championship without him. Say what you want, but Miami was not winning a championship without LeBron. Durant has definitely put himself in the best position to win an NBA championship, but as an NBA fan I have to admit, I am disappointed in Kevin Durant as a basketball player. OKC wasn’t some horrible team that couldn’t put the right pieces around him. In fact, the Thunder just lost to the Warriors in the Conference Championship, after chocking away a 3-1 series lead. Not only that, but after trading Serge Ibaka to Orlando and acquiring Victor Oladipo and Domantas Sabonis, I believe the Thunder would have become an even better team if Durant had chosen to stay. Durant explained his decision in a Players Tribune article, titled My Next Chapter. He said, “The primary mandate I had for myself in making this decision was to have it based on the potential for my growth as a player.” As much as I respect Durant, I have to call him out on his reasoning. Going to Golden State will not allow his game to grow; in fact it will stifle it. 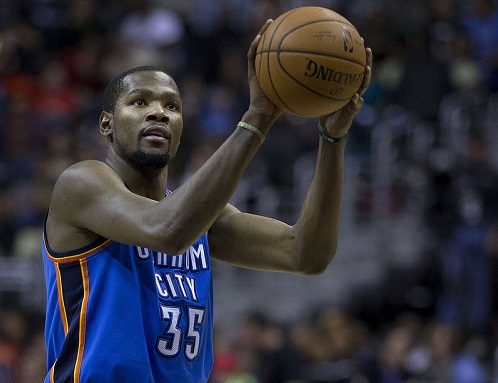 Just by the nature of the roster, Durant will have fewer touches and his numbers are almost sure to decrease. We all know the actual reason KD chose the Warriors; it’s because they give him the best chance to win a title, plain and simple. Let me reiterate, I am not mad at Durant for leaving OKC, actually as a fan I should thank him for making the 2016-2017 season now one of the most anticipated seasons in recent memory. I am not hoping for him to either fail or succeed in Golden State, as an NBA fan I always root for excitement. I’m just disappointed because Durant just gave up his opportunity to be seen as an all-time great, something I believe he had the potential to become.